Public Health England has been talking about the steps that can be taken to reduce air pollution. One of its recommendations is to stop vehicles idling close to places such as schools and hospitals. There has been relatively little research into how common a phenomenon idling outside schools is. It is clear, however, that when looking at the impact, the sort of vehicle involved is crucial, with considerably lower emissions generally coming from newer vehicles. Many modern cars and buses have stop-start systems, which automatically switch off the engine when a vehicle stops, although those may be disabled. A project commissioned by the Mayor of London's office in 2016 measured changes in pollution after a series of "action days", during which teams of volunteers patrolled the streets in four areas of London, asking drivers to turn off their engines. They found levels of black carbon - a pollutant associated with car exhausts, which has been linked to lung and heart disease - were 36% lower after these "action days" next to a primary school in Wandsworth. But the results were not so conclusive in every area - in the City of London there was a 33% increase on the first test day and a 22% decrease on the second. The researchers said the Wandsworth location was particularly well-suited to the study, whereas in the more central locations, vans and lorries spread out along the street rather than being concentrated in one location. This made it harder to measure a strong signal. The report said that idling at school gates was "a problem across the capital and it was pleasing to see the greatest reduction in concentrations" outside the school. A piece of research in the US, published in 2013, looked at air quality in four schools before and after campaigns to stop vehicles idling. It found that there had been significant reductions in air pollution at the schools with more buses - those with fewer buses did not see a significant reduction in the concentration of air pollutants. 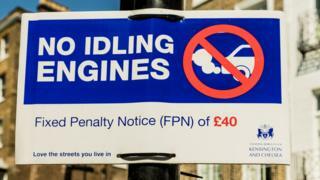 Local authorities in the UK already have the power to issue fixed penalty notices to motorists in parked vehicles who refuse to turn off their engines when asked. The emissions consultancy Cambustion has looked at when it is worth switching of engines to reduce emissions. It found that for emissions of nitrogen oxide from a diesel car meeting Euro 5 requirements (that is broadly any diesel car made before late 2015) it is worth switching off the engine if you expect to be stationary for at least 30 seconds. For Euro 6 diesel cars (those manufactured after 2015) it is worth switching off if you are not going to move for three seconds. The company also told the BBC that the most emissions come from a completely cold start at the beginning of the day and for hard accelerating. Speed bumps cause particularly high emissions because of this. The body which produces national health guidance, the National Institute for Health and Care Excellence, could not find strong evidence that linked changes in driving style to changes in ambient air pollution. But it also agreed that encouraging people to change their driving style was "unlikely to have any negative effects". Transport for London says it tells its bus drivers to turn off their engines at bus stands and when regulating the service, and adds that it will ensure all buses in London have zero-emission engines by 2037. FirstGroup, which operates local bus services around the UK, says it encourages drivers to turn off their engines "where possible", and that its newer vehicles' engines will automatically cut out if they are idle for a certain period of time. Reality Check: Does pollution cut short 40,000 lives a year?